Assigned status Up to Date on August 31, 2017. Ligneous conjunctivitis is a rare form of chronic, recurrent conjunctivitis characterized by wood-like, fibrinous pseudomembranes, which may be associated with systemic disease manifestations. Ligneous conjunctivitis may be inherited in an autosomal recessive pattern due to mutations in the plasminogen (PLG) gene and a variety of other genes, associated with type I plasminogen deficiency (hypoplasminogenemia), leading to impaired wound healing. There are no known risk factors for ligneous conjunctivitis, other than a genetic predisposition. The histology shows ulcerated conjunctiva with sub-epithelial, amyloid-like, eosinophilic material containing clotted fibrinogen and immunoglobulins, accompanied by lymphocytes, granulocytes, and plasma cells (Figure 1). The conjunctivae, more so than other mucous membranes, are susceptible to frequent exposure to irritants, such as dust, local infection, minor injury, and trauma, especially in young children. This trauma induces the wound-healing cascade, which begins with fibrin matrix deposition. The fibrin acts as scaffolding for granulation tissue and then collagenous tissue for wound remodeling and eventual healing. Plasmin acts to degrade the fibrin clots, and it is formed from cleavage of the plasminogen. Plasminogen deficiency leads to impaired healing of injured mucosa with accumulation of a serofibrinous material that forms the fibrin-rich pseudomembranes, which harden giving the characteristic “woody” appearance. Additionally, surgical excision of ligneous pseudomembranes, as the primary intervention, can precipitate further exacerbation of inflammation and perpetuate the formation of these pseudomembranes. There is no primary prevention for this disease entity as it is often inherited. The diagnosis of ligneous conjunctivitis may be clinical initially based on history and examination of the eye, but it may be confirmed with laboratory data demonstrating decreased plasminogen activity and pathology showing pseudomembranes with a fibrin-rich component. Involvement of another mucosal site or a positive family clinches the diagnosis. Although this may occur at any age, the history for ligneous conjunctivitis typically involves an infant or child who is female more often than male, presenting with recurrent conjunctivitis symptoms including discharge and redness of the conjunctivae, which may coincide with systemic infection. The ophthalmologic examination typically shows thick, firm pseudomembranous structures on the palpebral conjunctiva of the eye (Figure 2). Approximately 50% of cases are bilateral, and affected individuals have a predilection for upper-eyelid involvement followed by lower eyelid and bulbar involvement. The most common initial signs of ligneous conjunctivitis are mucoid discharge, tearing, and redness of the conjunctivae. This is followed by palpebral conjunctival pseudomembrane formation (see Figure 2), and it progresses to the mucosal thickening with a wood-like consistency, which replaces the normal eyelid mucosa. The patient may present with multiple recurrences or chronic pseudomembranous conjunctivitis, which may be preceded by or coincide with systemic signs, such as fever, upper respiratory tract infection, ear infections, or in females, urogenital tract infection. The diagnosis of ligneous conjunctivitis can be challenging given the pseudomembranous presentation that can be associated with other diagnoses (see differential diagnosis below). However, the suspicion must be raised if there is recurrence, particularly despite peeling of the membranes, or if systemic mucosal involvement is noted, especially in a child. Once there is a suspicion for ligneous conjunctivitis, evaluation of the ears, oropharynx, tracheobronchial tree, and female genital tract should be undertaken to look for pseudomembranes on those surfaces. Involvement of the airway can be life-threatening. Additionally, examination of sun-exposed skin may show juvenile colloid milium. 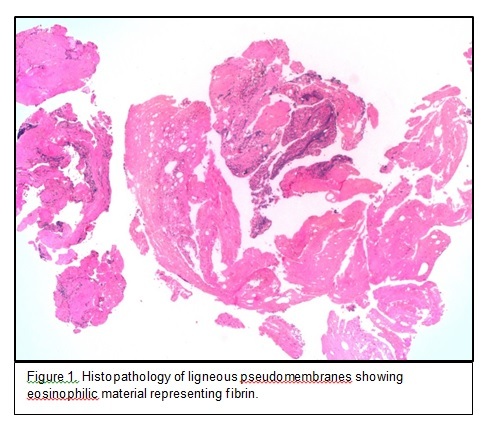 While this may be a clinical diagnosis based on recurrence and clinical appearance, surgically excised pseudomembranes should be sent to pathology to evaluate for the eosinophilic predominance due to the fibrin-rich deposition (see Figure 1). Moreover, this tissue should be tested for amyloid, as this disease can mimic ligneous conjunctivitis. Low levels of serum plasminogen may be noted on laboratory studies. There is no consensus on the curative treatment for ligneous conjunctivitis. Numerous treatments paradigms have been pursued and most case reports demonstrate decreased recurrence with a combination of medical and surgical therapy. Schuster and Seregard (2003) reviewed the literature on treatment of ligneous conjunctivitis between 1966 to 2002 and suggested use of a topical fibrinolytic agent, such as plasminogen or plasminogen activator (tPA), followed by surgical excision, and a prolonged, intensive topical heparin course, which is tapered once wound healing is complete. This may be supplemented by topical corticosteroids with or without topical cyclosporine to decrease inflammation. Topical plasminogen concentrate has shown some success in effectively treating the pseudomembranes in few cases and is currently being tested in clinical trials; however, this is not commercially available in the United States. Many other individual and combination treatment approaches, listed below, have been tried in small studies; unfortunately, many show recurrence after withdrawal of the topical agent. These patients need to be evaluated frequently to monitor for recurrence of pseudomembranes. While the initial follow-up will be more frequent, once the treatment is tapered off, these patients are still at risk of recurrence soon after treatment or even many years later. Polycarbonate glasses may be helpful in protecting the eyes from environmental trauma and initiating the cascade of ligneous conjunctivitis. Surgical excision alone has a tendency to lead to rapid recurrence of pseudomembranes due to the trauma induced in these patients who have deficient wound healing. Thus, surgery should be accompanied by pre- and post-treatment with the topical plasminogen (if available), topical and/or systemic fresh frozen plasma, topical steroids, topical cyclosporine, or topical heparin to maximize the chance of recovery without recurrence. These patients should be seen within days following excision of the pseudomembranes to evaluate for reformation, which can occur as early as 48 hours. In the aforementioned studies, there was often recurrence upon withdrawal of the topical agents or with isolated surgical excision, contributing to the recurrent, recalcitrant course of ligneous conjunctivitis. Long-term inflammation can lead to scarring of the cornea, neovascularization, and corneal perforation, all of which may result in vision loss. In young children, these complications can also lead to amblyopia. Moreover, chronic steroid use can lead to steroid-induced ocular hypertension, and so this must be considered and monitored. The prognosis of ligneous conjunctivitis depends on the ability to control the inflammation and recurrence of the pseudomembranes. Corneal involvement portends a poorer visual prognosis. Systemic involvement of respiratory tract pseudomembranes can be life-threatening. ↑ 1.00 1.01 1.02 1.03 1.04 1.05 1.06 1.07 1.08 1.09 1.10 1.11 1.12 Schuster V and Seregard S. Ligneous conjunctivitis. Survey of Ophthalmology. 2003 Jul-Aug;48:4, 369-388. ↑ 2.0 2.1 2.2 2.3 2.4 Mehta R and Shapiro AD. Plasminogen deficiency. Haemophilia. 2008 Nov;14(6):1261-8. ↑ Schuster V, Mingers AM, Seidenspinner S et al. Homozygous mutations in the plasminogen gene of two unrelated girls with ligneous conjunctivitis. Blood. 1997; 90: 958-966. ↑ 4.0 4.1 Ku JY, Lichtinger A, Yeung SN et al. Topical fresh frozen plasma and heparin treatment of ligneous conjunctivitis in a Canadian hospital setting. Canadian Journal of Ophthalmology. 2012 Oct; e27-e28. ↑ Pergantou H, Likaki D, Fotopoulou M, et al. Management of ligneous conjunctivitis in a child with plasminogen deficiency. Eur J Pediatr. 2011 Oct;170(10):1333-6. ↑ Gürlü VP, Demir M, Alimgil ML et al. Systemic and topical fresh-frozen plasma treatment in a newborn with ligneous conjunctivitis. Cornea. 2008 May;27(4):501-3. ↑ Hiremath M, Elder J, Newall F et al. Heparin in the long-term management of ligneous conjunctivitis: A case report and review of literature. Blood Coagul Fibrinolysis. 2011 Oct;22(7):606-9. ↑ DeCock R, Ficker LA, Dart JG, et al. Topical heparin in the treatment of ligneous conjunctivitis. Ophthalmology. 1995. 102: 1654-1659. ↑ 9.0 9.1 Tok OY, Kocaoglu FA, Tok L et al. Treatment of ligneous conjunctivitis with amniotic membrane transplantation and topical cyclosporine. Indian J Ophthalmol. 2012 Nov-Dec;60(6):563-6. This page was last modified on March 21, 2019, at 11:03. This page has been accessed 54,333 times.